Creators: Interested in using Mister US? Click here! Awakening Comics #2, where he has a cameo in mouse form. Big Bang #8, featuring his origins. Biological Psychology: An Illustrated Survival Guide, a textbook. That Mister U.S. guy shows up in some odd places, doesn’t he? Buzzboy #2, a one-panel cameo establishes Mister U.S. as part of the book’s backstory. Chesty Sanchez Super Special #1, in an ad/pin-up with Chesty. Everwinds #4, which uses the Awakening version in a Hostess ad parody. Licensable Bear™ #2, where he attends a licensing convention. Licensable Bear™ #3, where he chats on the phone. Licensable Bear™ #4, where he comes back from the dead, and does some other things while he was at it. I Am Not A Superhero!, an online comics story focusing on Mister U.S.’s secret identity. Web Cartoonist Choice Awards 2005, where Mister U.S. presented the award for best superhero/action comic. 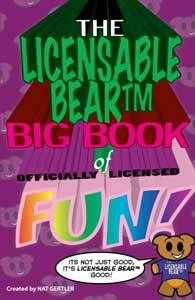 The Licensable Bear™ Big Book of Officially Licensed Fun! reprints all his Licensable Bear™ appearances. Other appearances are currently at the discussion stage. We will announce more soon! This is the only Mouster U.S. panel from Awakening Comics 2. The character reappeared in a faux-Hostess ad in Everwinds 4!